Michael Blankenship has been a woodworker all his life, but remarkably he didn't become a woodturner until he lost his sight due to a rare disease. 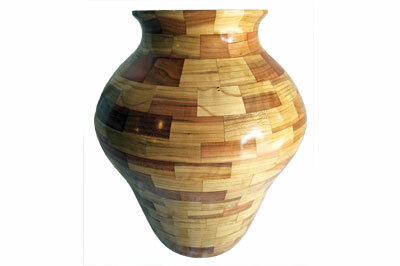 Based in Chatham, Illinois, he uses timber from urban logs or trees that would have ended up in landfills. Each bowl he produces is unique. Here, Michael tells us how he learnt to turn and how he teaches and inspires other turners. Before losing his sight, Michael worked at a hospital as a Cardiopulmonary Technician and did flat woodwork in his garage in his spare time. "I made furniture and grandfather clocks and lots of scrollsaw pieces. 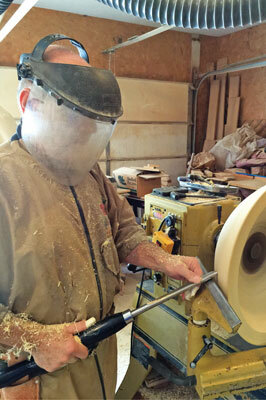 I had never seen a bowl turned on a lathe", he says. About 11 years ago he developed a rare disease called AZOOR. "At that time, there were only 500 documented cases and no one ever went blind. I was the first," he explained. "The disease process started with the flu and caused a type of autoimmune disease in which the antibodies that were developed to destroy the flu started to destroy the cones and rods of my eyes. It took a year to diagnose the rare disease and then a year of unsuccessful experimental treatments before I went completely blind. I have absolutely no vision at all. Totally dark." 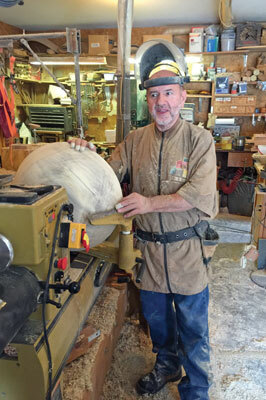 In the meantime, as he did not expect to lose his sight, Michael started a small sawmill business with his brother-in-law and it was here that he had his first experience of turning a bowl. 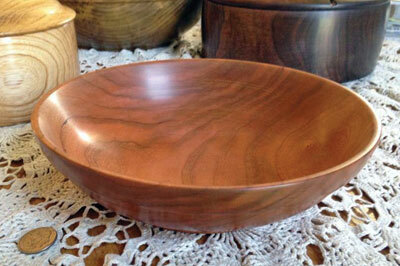 "A customer – now a good friend – placed into my hands a bowl that he had turned on a lathe. I knew nothing about turning on a lathe, I had never even seen one turned when I had sight. My friend said that I should try turning a bowl. I told him I did not know how and was it not dangerous? He told me that if I went really slowly and took my time I could make a bowl. My sons had a mini lathe that was in the corner of the garage that they made pens on a few times, so I decided to venture out into the garage for the first time in three or four years and give it a try. I took a faceplate and screwed it to a glued-up piece of wood and started chunking out a bowl. I went into the house and told my wife ‘I’m a wood turner.’” Michael admits that his first attempt was not entirely successful: “It looked awful, something like a dog dish! Thick and heavy and flat on the bottom.” However, this did not put him off him and he was determined to learn more about woodturning. His essential tools are the lathe, 12mm bowl gauge, 12mm scraper, grinder and sandpaper. “I always tell my wife that I don’t want any more tools, I need them!” he says. He spends roughly six to eight hours a day in his workshop, he turns for a few hours, then spends time cleaning, sanding and finishing. As a blind turner, it takes him a little longer to make an item. 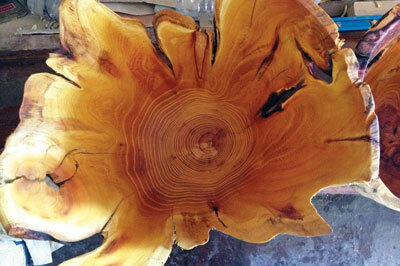 A typical simple bowl takes him between one and one-and-a-half hours to complete. To aid in his turning, Michael has modified an adjustable circle hole cutter to enable him to turn any size of tendon easily. To do this, Michael took the drill bit out of the centre and discarded it. He then turned the cutter around 180° in its holder. Instead of cutting a hole, it now cuts a straight tendon or spigot the chosen size every time. If you need a dovetail, a pass with a slew with create it. This device is mounted into a jacob’s chuck in the tail stock – hang onto it – and advance it slowly. In the future, Michael wants to do more demos for clubs and at symposiums. Michael has, in fact, just been accepted to the 2016 AAW symposium in Atlanta, Georgia. He has also been invited to demonstrate in the Australian symposium in 2018 and is demonstrating in Vancouver, Canada and Seattle, Washington in 2016, and in 2017 at the Oregon symposium. Clearly Micheal has a busy few years coming up! “I love doing demos especially since it encourages clubs and other turners to help people with disabilities,” he says. 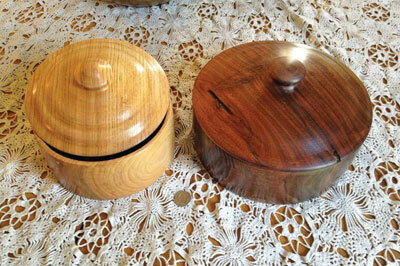 “My demos also encourage those with disabilities such as vision loss to not give up their love of woodturning. I show that there are other ways to achieve the same goal – turning.” As well as this, Michael’s plans also include mastering new turning skills. 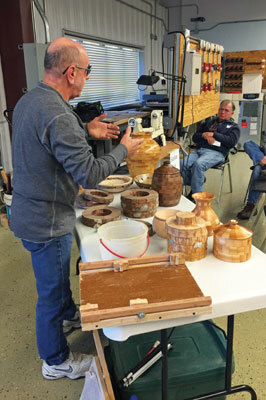 “I see myself continually trying new techniques in woodturning. I recently started segmented turning and that has given me a new challenge that I can attempt to conquer.” We look forward to seeing the results!